Boba is my latest obsession. 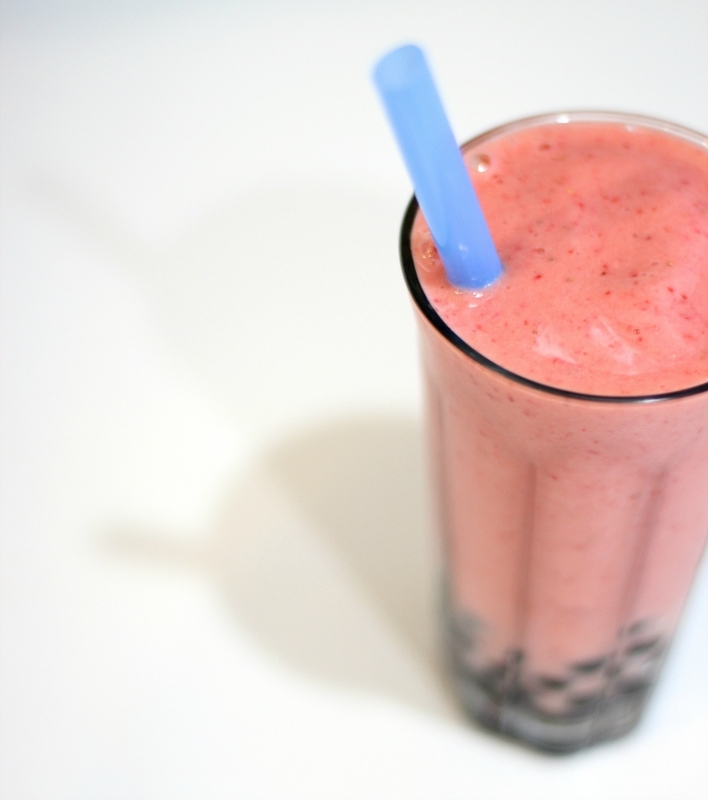 Also known as bubble tea or black tapioca, boba is everywhere in LA. I mean, I can't even walk across campus without spotting a little makeshift boba tea stand. Sadly though, boba is a bit harder to come across in Miami (where I've been spending summer break.) In order to keep my obsession satisfied throughout the summer months, I decided to attempt making boba at home. And guess what? I've learned it's about as easy to do as boiling water. Together with Brenna (my BFF since high school,) we made a little video showing you how simple it is to make boba at home. We also whipped up an incredibly creamy, tropical mango pineapple smoothie to go with. 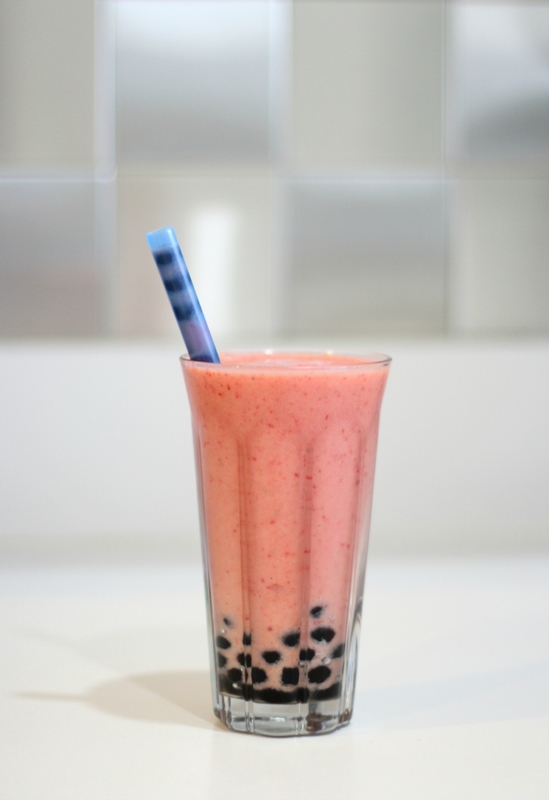 The perfect compliment to those chewy lil' tapioca pearls. For those of you who have never tried boba, you're probably wondering why anyone would ever eat a bunch of chewy, fish egg-looking blobs. But after you try them, trust me, you'll be hooked too. And for those of you who don't necessarily love mango (covering all my bases here,) I've added an additional smoothie recipe below - one that's simple, that I've made countless times. A strawberry pineapple smoothie that's a refreshing combo of tart and sweet. 1. Boil 5 cups of water in a deep saucepan. Once boiling, add the dried tapioca pearls. When the pearls float to the top of the boiling water, cover the pan with a lid and continue boiling for 5 minutes. 2. After 5 minutes of boiling, turn off the heat and let the tapioca pearls simmer covered for another 5 minutes. Then, strain and rinse the boba with cold water to stop the cooking process. 3. Next, make the simple syrup that will keep the boba from drying out. Boil 1/2 cup of water in the microwave (2 minutes). Add in 1/2 cup of brown sugar immediately, and stir until it is dissolved. Add the boba into the simple syrup. 4. For the smoothies, combine all ingredients in a blender and blend until smooth - adding more liquid if necessary. Be sure to use frozen fruit! That's the key to a creamy, cold smoothie. 5. Scoop a small amount of the boba and syrup into the bottom of a tall glass. Pour the smoothie on top, serve with a wide straw - and sip up! Mango Pineapple Smoothies with Boba some different sort of name right?But yeah so nice.I will try it this weekend.I think you should write on different forums where you can easily provide best dissertation help to others.Thanks for nice post and tasty recipe.